You may have already looked at the title for this week's IKEA Vrijdag post and wondered, "Wait, if you did the kitchen chairs last week, why aren't you doing the kitchen table this week?" The simple and honest answer to this legitimate inquiry: The table wasn't nice and neat like the ads in the IKEA catalog, so I couldn't take a picture without embarrassing myself... So, instead we'll keep featuring chair reviews for the sake of forcing some sort of continuity. This week, we look at the Tullsta Fauteuil/Armchair. 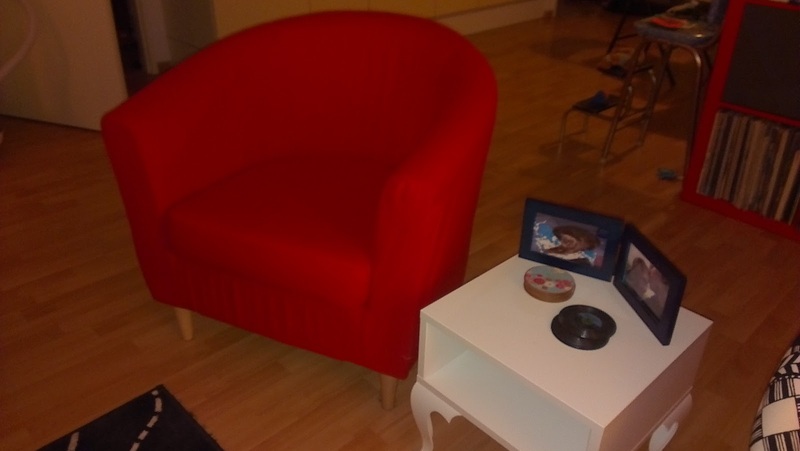 We bought two of these armchairs in red for our living room. I think it's worth noting that that the Tullsta Armchairs sold in the US come with a small back pillow - ours did not and are not offered on the IKEA Dutch website. Europeans in general don't mind sacrificing comfort for style; and I think that's okay in this case since I like the chairs without the pillows. Collecting the chairs from the IKEA basement warehouse was a bit funny if only because you basically pick up a box the size of the chair. The only thing to "build" on the chair is screwing 4 legs into the bottom. They go in easily, and there's no "wobble" issue. It's not a heavy piece of furniture, so it's easy to move around when needed, but the downside is that with the Little Man's acrobatics, I'm waiting for the day he and the chair tip over together. I like the vibrant color of the red on the chair, but I'm a little disappointed with the fabric. It's hard to spot clean without making a bigger, noticeable spot which has been a bit frustrating with leaking sippy cups, cats, and general child and adult clumsiness. We've managed to keep the chairs looking good, but it's not as easy as I would like considering the frequency with which we have to clean. We give the Tullsta Fauteil Armchair 3.5 Swedish meatballs on our 5 meatball rating scale. The chair loses points for the spot cleaning issue, but in general, we're happy with the purchase. The red chair looks so nice!